I’m a software developer by training. This has given me some amazing opportunities to create just about anything that’s digital. Knowing how to program when software is eating the world is truly a gift and I highly recommend everyone to learn at least the basics. I have however felt for a long time that I would want to be better at not only building software but also making it more, well, I guess beautiful is the word. My aesthetic ability is far from where I want it to be. I even think that, could I start my career over again, I should have chosen to focus much more on design and user experience. I wrote a blog post a few years ago about making it work, making it pretty and making it fast – in that order. Perhaps I should re-prioritize, making it pretty is the most important goal for a new project. The reason: if you can’t get people emotionally attached somehow to your product it doesn’t matter how many features it have, it will fail anyway. You can’t be good at everything. Accept it. Yes, you can learn but the more wide your skill set is, the less deep it will become as well. Obvious, yes, but worth reminding oneself of from time to time. If anything, there is one meta-skill (and, yes, it is a skill – some people are better at this than others) that you really should try to be better at: getting things done. Executing. Doing stuff. Getting other people to do stuff. Making things happen. Moving the needle. If you’re good at that, you can do anything. Accept your limitations. Focus on getting things done. That’s it. Update: great post. Get disciplined, not motivated. My theory of serendipity is still evolving, but from what I’ve seen, it’s better to think in terms of “allowing” serendipity rather than “seeking” it or “creating” it. Opportunity is all around us, but we have beliefs and habits that block it. The two biggest blocks to serendipity seem to be ego-fear and “other plans”. “Your opportunity cloud is the sum total of all the positive things that can happen to you at one particular moment. It is what happens when you position yourself to be in a spot where good things happen. For example, exposing your skills on a blog, going to a mingle party, connecting with the right people on social networks, moving to a larger city, becoming good at pitching yourself or your product etc. Call it whatever you want, just don’t call it luck. Back in the industrial age, a career meant working for the same company and climbing the corporate ladder inside that company. After 50 years you were rewarded with a gold watch and retirement. 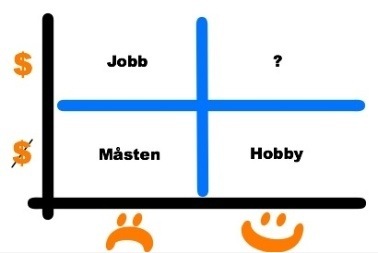 People jobhop from position to position in different companies. It’s more accurate to say that an individual works for a market or a cluster of companies (like “PR agencys” or “startups” or “the telecom industry”) than one particular organization. It is still a fairly linear progression between jobs, though. Even for a jobhopper a career has a direction – upwards (in some sense of the word). You can call this the ladder strategy for a career. You stand on one level of the ladder for a while, then you move up to the next level. But there is a different strategy or at least a different point of view you can use for your career: the opportunity cloud. Your opportunity cloud is the sum total of all the positive things that can happen to you at one particular moment. It is what happens when you position yourself to be in a spot where good things happen. For example, exposing your skills on a blog, going to a mingle party, connecting with the right people on social networks, moving to a larger city, becoming good at pitching yourself or your product etc. Call it accumulation of opportunity capital that may or may not be turned in to real money. If you’re working as a free agent, your opportunity cloud is probably your most valuable asset. You need to nurture and grow it constantly. As opposed to the career ladder, it is unpredictable, almost chaotic. Some people even call it “luck” but that’s almost never the case. That investor calling you because 6 months earlier you met her husband at a party – that’s not luck. That consultant work that suddenly pops up in your inbox because someone googled for “elite java skills” and found your blog – that’s not luck. There are tools that help you manage your cloud (contact/CRM systems, todo-lists etc.) but the fact remains that it is a much more chaotic existence than the more linear and stable employment. On the other hand, it’s slightly more difficult to “move up”. It is, by it’s nature, unpredictable. Some people – no, most people – can’t handle it. They rather have the fixed income and stable environment that comes with an employment. Even if that means killing off most of the opportunities in your cloud. Actually – most people doesn’t even realize they have an opportunity cloud. They simply don’t see it. It is, as I mentioned, more a different point of view than a strategy. So, where am I going with this? Only that you should know that you have a choice and that you might even switch between the two mindsets in different phases of your career. I also want more people to see the cloud they have around them. You can of course start growing it while you’re employed. See the cloud, build it. Don’t get stuck standing on a ladder. When everything else is free, these are not. En bra människa. Ett gott liv. 1. Man försöker skapa ett så bra liv som möjligt åt sig själv. 2. Man försöker skapa ett så bra liv som möjligt åt sin familj och nära vänner. “What should I do with my life?”. That’s The Question. A related (or maybe it’s the same?) question is “who do I want to become?”. Po Bronson explores these questions in this Fast Company article from 2007. Read it, and ask yourself The Question! I am more and more thinking that personal growth and business development goes hand in hand. They can’t be separated, especially for small businesses. It can’t, no it must not, be about only money. You have to create something you love working with if the business is to be sustainable. Growing a business is also about growing the individuals working with that business. We are leaving the industrial age. That also means leaving the industrial ways of thinking. Today a business has be agile and rewarding for the people involved. It has to have values, at least if it wants to survive in the long run. Att dela upp livet i fritid och jobb är vanligt. Fritid, fri tid, är de minuter av ens liv man kan göra vad man vill. Ett jobb, å andra sidan, är något man tvingas till för att kunna försörja sig tills pensionen då man äntligen kan ägna sig åt fri tid hela tiden. Jag tycker den uppdelningen är lite för enkel. Alltså, det finns två sorters sysselsättningar: roliga och tråkiga saker. Bland dessa är det sedan vissa som genererar intäkter och vissa som inte gör det. Utmaningen med ett hållbart företagande eller en givande karriär är att befinna sig så mycket som möjligt i rutan uppe till höger. Problemet är att det saknas ett ord som sammanfattar denna ruta på ett bra sätt. De flesta människor får negativa associationer av ordet “jobb”. Att något är jobbigt innebär att det är fysiskt ansträngande eller tråkigt. En hobby är å andra sidan något man gör enbart för nöjes skull. Ett lämpligt ord skulle kunna vara en sammanslagning av de båda: jobby. Det låter dock lite för likt jobbig, annars gillar jag ordet. Kanske någon läsare har ett bättre förslag? På tal om att finna balans, den här var läsvärd. She started down a path of “self-accuratizing,” her term for finding a career that would make her happy. Her first stop was a decorative wall-finishing business, a nod to her study of art in college. Three years later, after spending three days on top of a scaffolding painting a living room, she realized that she didn’t want to be doing that when she was 55, and she quit the business. She spent time in Mexico, “learning through simple, conscious living, what joy really feels like.” She took up ballroom dancing. She completed an M.B.A. in sustainability. Now she uses visual mapping to help businesses with their conceptual planning; the work combines her interests and experience in art, business and using her hands. En lågkonjunktur är ett ypperligt läge att testa nya saker. Det har t.ex. aldrig startats så många företag i Sverige som 1994. Många undrar nu vilka som är framtidens jobb. Själv är jag övertygad om att tjänster mellan privatpersoner är var den stora massan av jobb kommer att finnas. Hantverk, konstnärskap, lajv-musik kommer att få ett uppsving när automatiseringen pressar priserna på allt annat till noll (något jag skrivit om flera gånger på min gamla blogg). Tyvärr hindras dessa jobb av de groteskt höga skatterna på arbete, en skattenivå som passar stora industriföretag men inte små tjänsteföretag. Skatten på arbete måste bort! Se även min gamla post om 2000-talets råvaror: underhållning, empati, hälsa, ungdom, information och social energi.